Take to the road with Jackpot Capital Casino and bring home some of the $100,000 in casino bonuses that they're giving away! 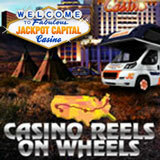 The motorhome is visiting all of the very best US casino destinations during the $100,000 Reels on Wheels event that continues at the casino, popular around the world, until August 24th.If you make it all the way to the final destination you can win the biggest prizes but even occasional players can win generous weekly bonuses and grand prizes. Jackpot Capital players automatically earn points when they play any of its games. iPhone, iPad, Samsung Galaxy and other Android phone or tablet players earn double scoreboard points. Every Monday until August 24th, hundreds will receive casino bonuses based on their scoreboard ranking -- up to $800 each. Mobile players can access the casino by entering m.jackpotcapital.eu in their smartphone’s or tablet’s browser. A weekly raffle will randomly award another $2500 in bonuses and many more players will win cash prizes in a Grand Prize Draw at the end of the trip. Two players that reach the final destination, Las Vegas, will each receive a $500 cash bonus. Even ten players at the first destination, Atlantic City, will get $100 each.